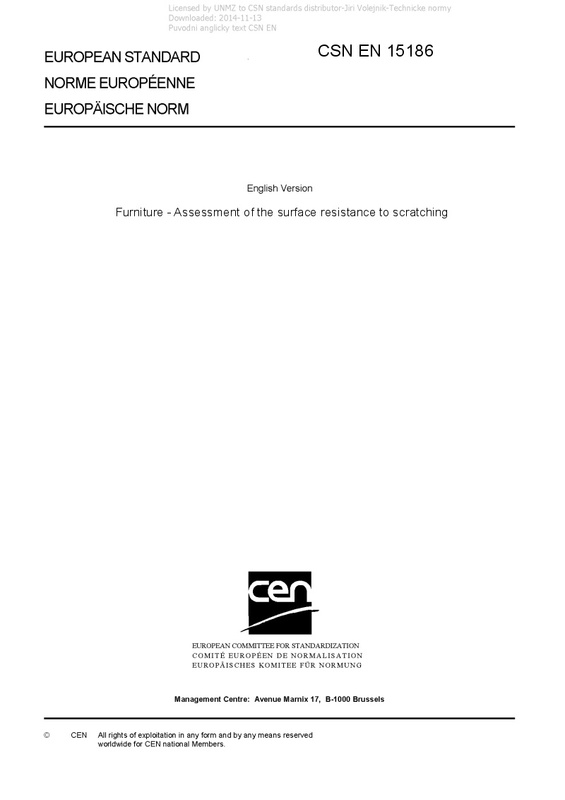 EN 15186 Furniture - Assessment of the surface resistance to scratching - This European Standard specifies a method for the assessment of the surface resistance to penetrating scratches. It relates to the rigid surfaces of all finished products, regardless of their material. It does not apply to finishes on leather and fabrics. Method A is suitable for all types of surface coatings and coverings except for melamine faced boards (according to EN 14322) and HPL (according to EN 438-1). It simulates measurable penetrating and/or deforming scratches. Method B is suitable for all types of surfaces. It simulates first visible scratches that may only be a change in the gloss. The test is intended to be carried out on a part of finished furniture. It can however be carried out on test panels of the same material, finished in an identical manner to the finished product, and of a size sufficient to meet the requirements of the test. It is essential that the test be carried out on unused surfaces.